Can Dogs Eat Tuna or are there any health risks? Vet approved! We often associate tuna, and other types of fish, as something cats, typically enjoy. But dogs are carnivores by nature, and certainly, aren’t opposed to enjoying all types of fresh fish. So, is tuna bad for dogs? The answer is no, tuna is absolutely not bad for dogs if served cooked without bones or skin. Canned tuna, on the other hand, is, in general, not recommended for dogs. Like anything else, it should be served in moderation, and in a natural cooked state. Boneless, skinless albacore tuna, yellowfin tuna, bigeye tuna, and bluefin tuna are all great options for your dog to enjoy. They’ll love the meaty taste, and tuna is loaded with protein, which is great for energy and building muscle! Avoid giving your dog raw tuna, sushi, etc. as this can be harmful to their immune system. It’s also important to stay away from things like tuna salad, or tuna with mayo of any kind. If you’d like to know more about how mayonnaise can affect your dog, you can check out our post. Offering cooked tuna steak with no bones and no skin is the best way to go. Canned tuna is a bit different than natural, fresh tuna, and there are a few things to consider. Yes, dogs can eat canned tuna, but it shouldn’t be a consistent staple in their diet. Canned tuna contains a very high amount of sodium, and can contain mercury, which can create heart problems in dogs who ingest too much of it. Mercury is an important concern among long-lived fish, such as tuna and swordfish. Obviously, one can of tuna isn’t going to do any damage, but if your dog is consistently eating it, the build up over time can cause vomiting, diarrhea, and of course, heart conditions. Another important concern associated with canned tuna is the added flavorings, such as spices, onion, or garlic that can pose a health hazard. Puppies can eat tuna in the same way adult dogs can, but they should only be given small amounts of fresh tuna, due to the mercury found in the fish. Can puppies eat canned tuna? It’s not highly recommended, but again, a small amount likely won’t cause any damage. Tuna fish shouldn’t be a staple in a puppy’s diet, and tuna for dogs isn’t a great option when compared to some other protein choices. Is Tuna Good For Dogs? Simply put, yes and no. While tuna can be a great source of lean protein, too much of it can cause health issues for dogs, especially when it’s canned. If you do feed your dog canned tuna of any kind, make sure it’s been packed in water, not oil! A bit of tuna won’t do harm to your dog, and they will likely even enjoy the taste and meatiness, but there are certainly better protein options available. 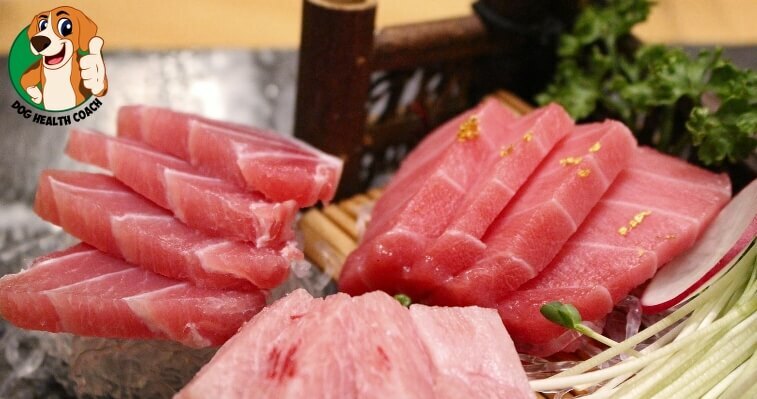 Tuna is also an excellent source of calcium, B vitamins, selenium, and omega-3 fatty acids. While it is not recommended that tuna should be a part of your dog’s staple diet, you can give small slices of tuna as an occasional tasty treat, or as a topping to increase the palatability of your pet’s meals. There are dogs that develop specific issues due to the tuna’s very high protein content; some dogs are allergic to tuna, while other dogs suffer from gassiness due to the high fat content (especially when you give canned tuna packed in oil). How about your dog? Have you given them tuna before? If you have, let us know how you prepared it to make it safe, and healthy for your dog (grilled/baked, etc. ), so other people can try it out, too!